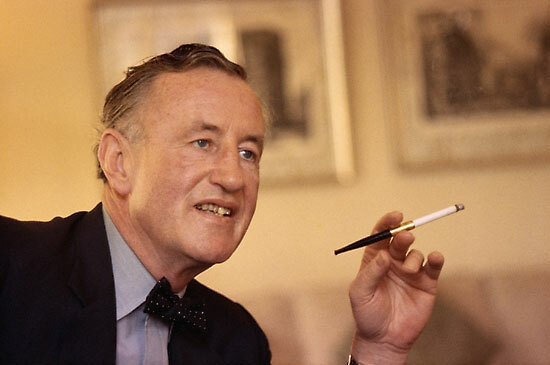 I don't understand how there haven't been more films made based on the life of Ian Fleming. The man who invented James Bond was as badass as James Bond, but a real person. He consulted with the Americans when they were setting up what eventually became the CIA. As a foreign journalist, he travelled the world before, during and after the war, which is why Bond is so well travelled a spy. Despite no espionage training whatsoever, he was chosen to work in Naval intelligence against the Nazis. As I learned at the recently closed Bond exhibit at TIFF, the plot of Casino Royale was based on an actual mission Fleming carried out against Nazi bank rollers (though he lost to them, inadvertently contributing to their war effort). He played golf with Christopher Lee regularly. James D'Arcy played him in 2011's Age of Heroes (with former Bond villain Sean Bean), about a mission Fleming organised for his 30 Commando unit, but other then that his exploits have largely taken place on the small screen, including once by the awesome Charles Dance. They can add one more to the list, as Dominic Cooper (Captain America) will appear in the title role of Fleming, a four episode mini-series set during the war in London, and explore his relationship with Muriel Wright (played by Annabelle Wallis), who would inspire Fleming's Bond girls in his future novels. The series will be produced by Sky in the UK and, oddly, BBC America across the pond, with a hopeful broadcast day of late this year.